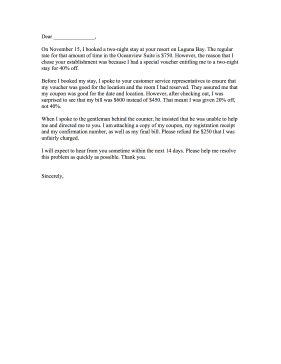 Customers who suspect they have been overcharged can use this service complaint letter to request a refund. On November 15, I booked a two-night stay at your resort on Laguna Bay. The regular rate for that amount of time in the Oceanview Suite is $750. However, the reason that I chose your establishment was because I had a special voucher entitling me to a two-night stay for 40% off. Before I booked my stay, I spoke to your customer service representatives to ensure that my voucher was good for the location and the room I had reserved. They assured me that my coupon was good for the date and location. However, after checking out, I was surprised to see that my bill was $600 instead of $450. That meant I was given 20% off, not 40%. When I spoke to the gentleman behind the counter, he insisted that he was unable to help me and directed me to you. I am attaching a copy of my coupon, my registration receipt and my confirmation number, as well as my final bill. Please refund the $250 that I was unfairly charged. I will expect to hear from you sometime within the next 14 days. Please help me resolve this problem as quickly as possible. Thank you.